A view of the Incredible Hulk at sunset. The Red Dihedral route takes a line just left of the right skyline. 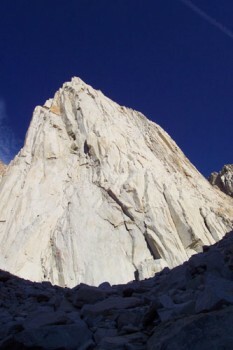 The upper five pitches of the route are not visible. I found a hand jam. Some nice spots with finger locks and beefy low angle liebacks with high friction smeary feet too. Great textured rock in 2nd Flatiron. Easy romping terrain everywhere. Approaching Boulder. Flatirons front and center! Time to generate this page: 0.33 secs.